Discovering a new species in Sabah is very likely! Home/News, Sightings, University of South Wales/Discovering a new species in Sabah is very likely! Great friend, educator and honorary Downbelow Marine and Wildlife Adventures staff, Professor Peter Roy Wiles, enjoys the fact that discovering a new species in Sabah is very likely! 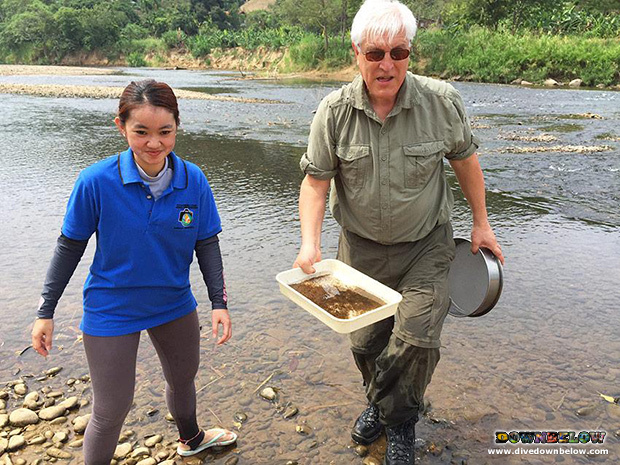 On an exciting day trip to the Kiulu River, nearby Kota Kinabalu, the professor is joined by Downbelow’s Marketing Director Joanne Swann and admin executive Shirley from our HQ, in search of a watermite! Professor Wiles’ years of research into watermite species have contributed enormously to the future of scientific studies of the miniscule arthropod, scientific name Hydrachnidiae. For the first couple of weeks of his visit to Sabah, Professor Wiles accompanied a group of students from the University of South Wales on their 5th annual tropical ecology field trip, which is hosted by our premier PADI 5 Star IDC Dive Centre. Marine conservation is, and always will be, an important element to the Downbelow company mission, and it’s a privilege and honour to host groups of school and university students on their unique educational program. The professor and his helpful assistants do find a watermite unrecognisable to our expert, however we must wait with bated breath for the results on whether it is definitely a newly discovered species, so follow this story to find out more! For more information on exploring the beautiful and exotic nature of Sabah, contact our experienced Sabah Travel Centre experts, who will be more than happy to create a suitable program for you! By Joanne Swann|2015-04-17T17:58:57+08:00April 21st, 2015|News, Sightings, University of South Wales|Comments Off on Discovering a new species in Sabah is very likely!